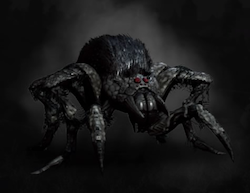 Arachnomorph is a Creature/Monster in The Witcher 3: Wild Hunt. Arachnomorphs are extremely fast and surprisingly intelligent. When in group their strategy is that whichever Arachnomorph is targeted will persistently evade the witcher. Other Arachnomorphs will sneak up on the witcher from behind. Counter this strategy by playing dumb, then surprise the Arachnomorph behind you with a flurry of strikes. Arachnomorph also possess deadly thread. They can even use this while fleeing. If the witcher is hit he'll be paralyzed and the Arachnomorph will certainly strike.